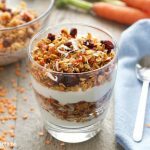 Carrot Cake Granola with red lentils is a healthy granola recipe. With a blend of red lentils, oats and carrots, this is a delicious, protein-packed breakfast! 3 cups large flake oats gluten free oats work great here too! Rinse the red lentils well under some cool water and then add them to a small pot with 2 cups of water. Watch for the water to come to a simmer and let the lentils simmer for about 3-4 minutes over medium heat. Remove them from the water as soon as they reach the al dente stage. You'll want them to be cooked but not completely soft. While the lentils are cooking, add the oats, grated carrots, spices, honey, canola oil and salt to a large bowl. Toss everything together well. Once the lentils are cooked, strain them well and gently pat them dry with a piece of kitchen paper towel. Add them to the bowl with the oat mixture and toss well until the lentils are evenly dispersed throughout the mixture and well coated in the honey and canola oil. Line a baking sheet with some parchment paper or your favourite baking mat and pour the granola mixture out onto the baking sheet. Spread the mixture out as evenly as possible and pop it in the oven! Bake the granola for about 35-40 minutes at 300 degrees Fahrenheit, stirring every 10 minutes to prevent over-browning. A few minutes before you pull it out of the oven the last time, stir in the coconut flakes and the raisins so they bake with the mixture for no more than 5 minutes. This will allow them to absorb some of the flavours without becoming overly chewy. Feel free to enjoy some of this Red Lentil Carrot Cake Granola right out of the oven while it's warm, or let the granola cool completely on the baking sheet before adding it to a large airtight container for storage to enjoy later. It keeps well for about a week in a large mason jar in the pantry, although it's so delicious I doubt there will be any left after a week goes by! !